Colour can and does bring life to any room. We all know about the drastic changes decorating with bold colours can make in any given room and how much appearances can and do change by simply switching out accessories in one colour to another. Once the colours are more prominent that simple decorations and accessories, and are on one or more walls, however, its oftentimes way harder to make the room work. Red walls, in particular, can be challenging. They do look fabulous, though, and in bedrooms in particular, so we have gathered some of the best decoration guidelines to make your red bedroom look great below. While a bright red may be a wonderful colour-choice for a wall of a living-room or kitchen, you should pick a more subdued, darker shade of red for your bedroom walls. The dark red creates a cozy atmosphere that helps to generate the kind of mind-set you need to easily slip into good dreams. Combine luxurious white furniture, and expensive (looking) rugs with your red walls to create an elegant, sophisticated style. 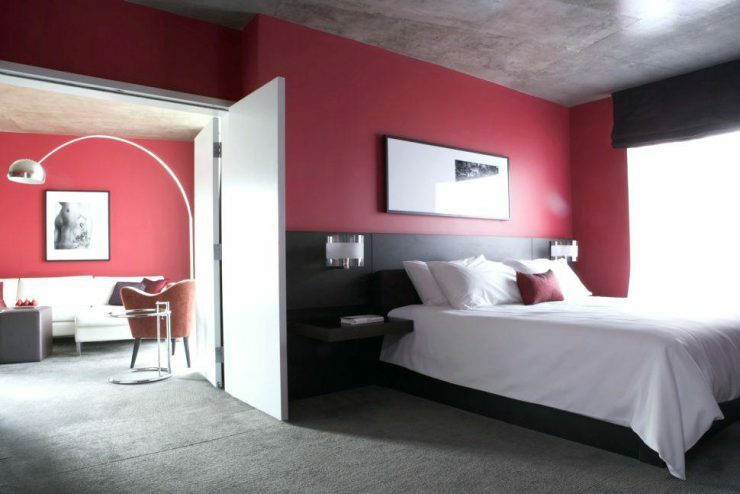 A room with all four walls painted in red can quickly become a tad claustrophobic. In oder to offset the colourful walls closing in on you, use light blues or whites to offset the red. As our example shows, these colours immediately lighten the room and turn an otherwise potentially constrictive environment into beautifully airy spaces. 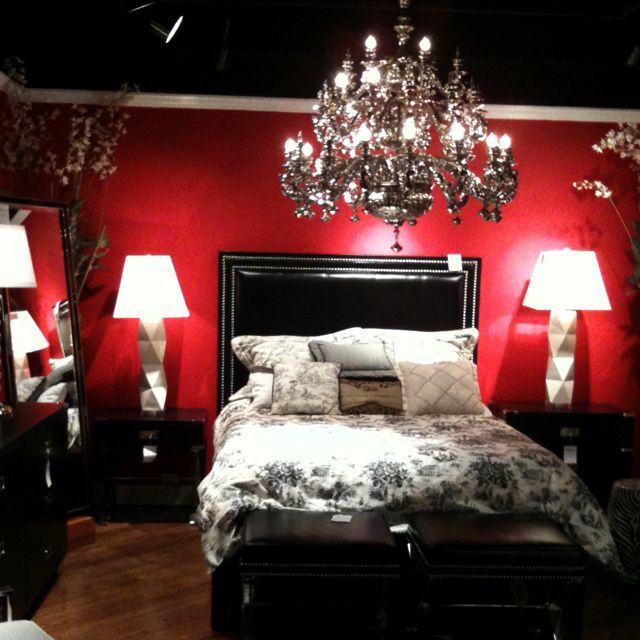 On of the best choices for red bedrooms is dark coloured furniture. 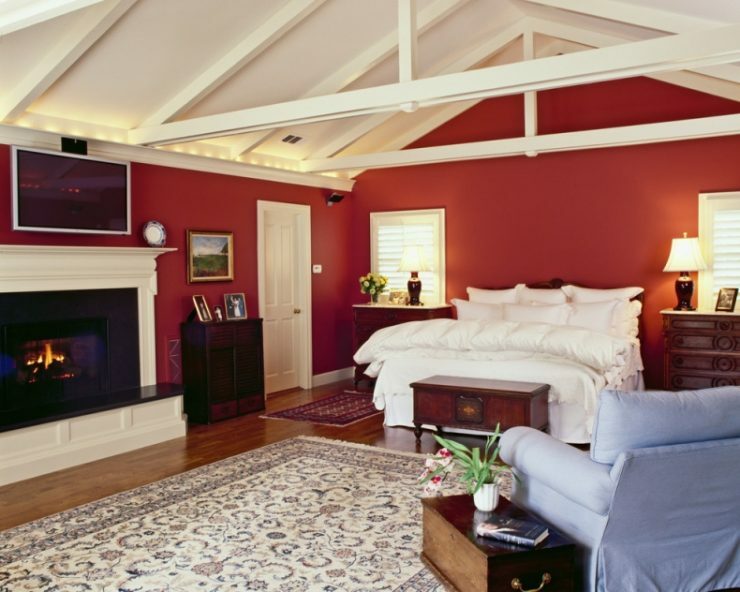 Wood in particular matches incredibly well with red walls, but only in its dark varieties. Make sure to combine the dark furniture with lighter floors or accessories to prevent making your bedroom an uninviting, dark hole. If you want colour in your bedroom, but don’t (yet) want to commit to a fully painted wall, test the waters with red accents. Draw the eye by painting a particular feature of the room’s wall (e.g. an alcove, or a shelf set into the wall) red and really highlight it with light. 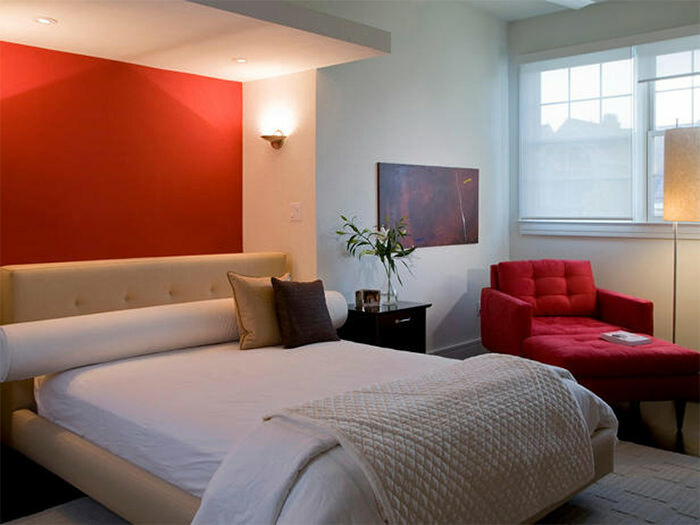 Select one wall of your bedroom to be paint in a vibrant red, and leave the other ones in lighter colours. 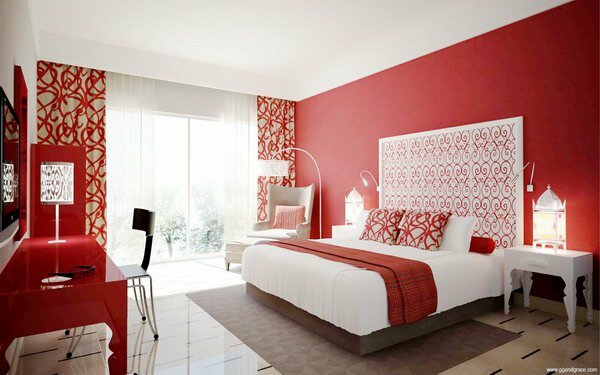 Let your chosen colour shine by picking up the red in your furniture, headboard, accessories, bed linen, etc. This way you create a stunning, colourful look that lets your room shine without the danger of being overbearing. As we have discussed before, black and white mix particularly well with red walls. Make use of monochromes to off-set your wall colour and create a stylish, modern look that won’t ever go out of style. Make use of our cultural conditioning and create a dramatic, theatre-inspired look by going all-out with your chosen hue of red. 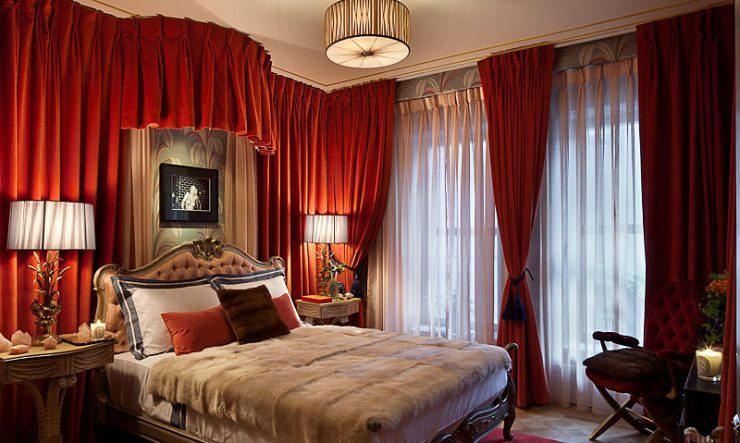 Invest in good quality red velvet curtains, a red shag-carpet, red throws, and the like to create a cinematic, theatrical look that easily transport you into another century. As our example picture shows, using red velvet tapestry is another way of creating red walls without having to restore to painting them. Be inspired by Japanese bedroom designs and create your very own zen-oasis in your bedroom. Use the sparse decoration and furniture of Japanese homes to create a unique, uncluttered space of calm and tranquility. 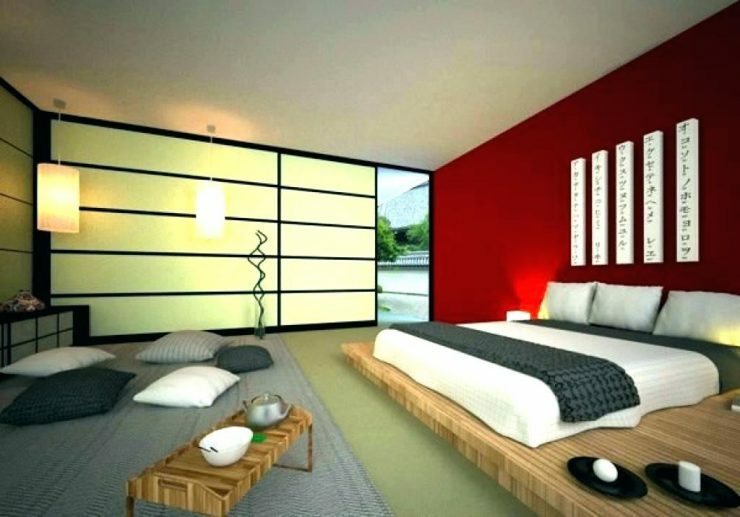 Add in a couple of true eastern staples like a futon bed, and your red bedroom could just as well be located in Tokyo, Osaka, or Kyoto! 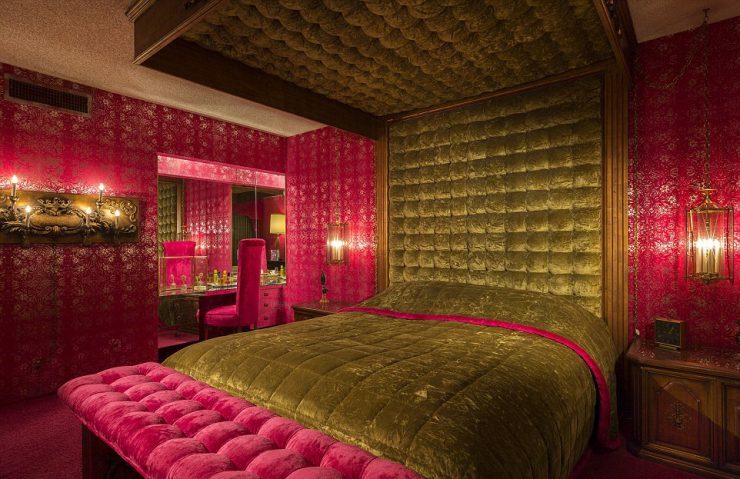 Ever fancied yourself sleeping in a 70s inspired, flamboyant bedroom done up solely in velvet? This is your chance! For a less over-the-top look, we suggest combining your red bedroom-walls with animal-prints or patterns to create a truly unique, eccentric style.